A 12th century bible by an unknown author. The bible likely was owned by a noble person based on the expensive production costs. This bible belongs to the Washington State University Manuscripts, Archives, and Special Collections. Photo by Sanna Wright, October 2018. After the advent of movable type in the 15 century by Johannes Gutenberg, the production of books and other written text was quickly produced and lead to cheaper reproduction of written work. Once introduced to the gridded cases of movable type carved out of lead the world was changed forever. While there was some movable type in China before Gutenberg’s invention, it had not yet reached a level of practical use and was not used in Western literature. 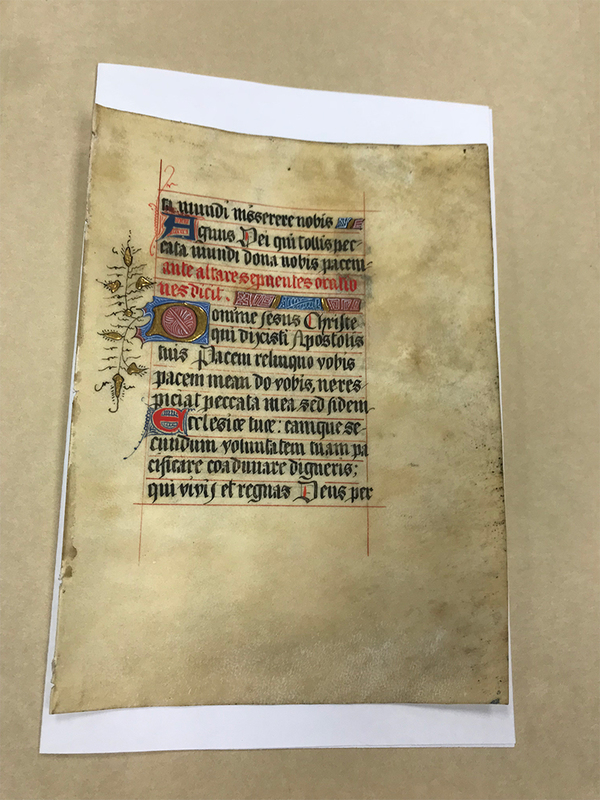 This 12th-century bible was created before the advent of moveable type and was most likely slowly transcribed over many thousands of hours by special artisans. This bible was very expensive to produce and was most likely owned by a noble person. This bible is especially well crafted, with gold leaf elements, and ornate lettering. Based on the grid-like lines (most likely to help the scribe write straight) the letters have an unusually high x-height. The height of the body the lowercase letters take up a lot of room. There is a lot of overhang, which is to be expected from a handwritten piece. The ascender height is not very long, with the lowercase T, D, and Bs being the same height as the dotted I’s and only slightly larger than the other letters such as m. The descender height is very exaggerated. Gs and Ps often have a descender that the same length as a typical letter from the baseline to the x-height. The bowl of capital letters such as A and C are rounded. However, the bowl of letters like capital D is very square and much more reminiscent of early movable type (which was designed to resemble handwriting). The beginning of each paragraph (or each sentence?) is very complex and colorful. While some other letters have small red decoration, these letters show how expensive this text was to create. The letters in some cases take up two whole lines or dramatically over the cap height. This contrast draws attention to the smaller details of the lettering. This entry was posted in 336 Blog, Type Anatomy. Bookmark the permalink.